PDA 24/7 is having their annual holiday season sale and Smart Box Design will be featured on the first day, December 1st. If you are looking for some deals stop by PDA 24/7 daily for the next 20 days. See you there. 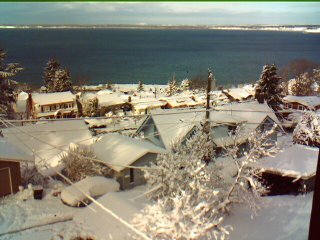 We had a great snowstorm yesterday that has closed most of Bellingham, WA. The paper asked residents to stay home if possible. The schools are closed which I m sure all the kids are celebrating. The snow is a beautiful sight to see. 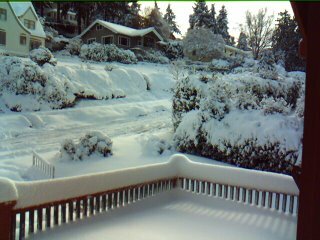 Snow still holds a child like wonder for me as I barely saw it growing up in Southern California. The attached pictures were taken from my Zire 72 PDA. The views are from my second story bedrooms. The water in the background is Bellingham Bay. Canada is just a mere 10 miles or so north of here. Although the Treo and Zire PDA have been criticised for the low end camera I think it is fine for quick pictures that you want to share online. I find it very convenient having a camera with me at all times as I take my Zire with me everywhere. I am thinking about moving up to the Treo 680. I will take a look at it as soon as the snow melts and I can get to the mall. Win a copy of any of my mobile games. Send me a picture from your Treo, PDA or Phone, and I will randomly select a winner or two. 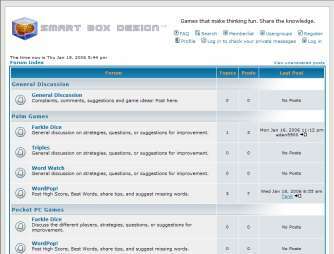 Send email to tsherman(at)smartboxdesign.com (replace the “at” with “@”).